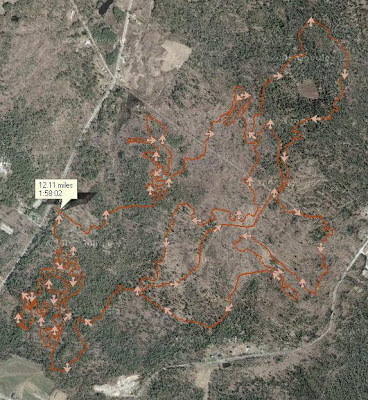 So I made it onto the Massanutten Mountain Trails 100 Mile Run waiting list...at spot number 65. While I am still positive, this deep spot has left me with a little doubt. Originally I was hoping I would be somewhere in the top 25, at least in the top 38 which is the number of the last wait list entrant that got to run the race last year. No such luck but that is okay. One cool thing is that the MMT 100 race board instituted this year is a full refund policy through January 29, so maybe that will incent some entrants to remove their name sooner so those on the waiting list have a better idea of their status. Either way, I plan on training like I am going to run it and either end up running it or be in real good shape to pace Jamie at Western States and for the 20th running of the Vermont 100. As long as I am still healthy and running and all my family is healthy, what and where I run is of little importance. As for my training, last week was really good in that I broke the treadmill barrier and ran on the machine. Each winter it takes some work to convince myself the treadmill is a necessity and the snowstorm last week did just that. I am lucky enough to have a nice treadmill in my basement that gets a lot more use than the typical home treadmill that serves as a drying rack. I do enjoy the consistency of the treadmill which allows me to run intervals and other workouts without much guessing. Also, it keeps me close to home so I can help with the kids if Kelly needs me. I do admit it takes a certain type of runner that can happily run on the treadmill, and I count myself as that type of runner. Besides, there aren't many better ways to build mental fortitude for distance running than running three plus house in one spot. I do admit to having done a great number of 2-3+ hour treadmill runs and I am not ashamed to say so! One thing that does help pass the time on the treadmill for me and which motivates me is a great flick to watch. I typically choose those movies that Kelly prefers not to watch. For me that means either Zombie or sci-fi/fantasy flicks. Last week I watched, for the second time, Night Watch which is a Russian movie in the vain of The Matrix. Check it out. Night Watch is the first installment of a trilogy (like The Matrix), the second of which is entitled Day Watch. All you sci-fi/fantasy geeks would be served well by checking these movies out. Enjoy. I am a two-time loser, and not in the Western States 100 good way. Saturday I was not one of the 360 or so fortunate ones chosen in the Western States 100 lottery. My chances were 16% and luck was not on my side. My buddy Jamie (pictured left) was one of the lucky ones. In fact, he was one of the first 20 drawn. Unbelievable. I am of mixed opinion as to how I feel. On the one hand, I am really disappointed because running Western States is on my running life list. And one never knows what time will bring in the way of health, fitness, and life. On the other hand, I am really okay with what happened. This will allow me to take the experience of a couple more 100-milers into the WS 100 when I am finally drawn. This will go a long way in getting me the coveted silver buckle. Also this saves me quite a bit of money. Good thing. Now I am a first time WS100 loser. One more failed lottery drawing in 2008 will guarantee me an entry into the 2010 running. That is as long as the two time loser rule remains in effect. The way the number of entries is rising big changes are inevitable in the entry system of the WS100. Now missing out on the WS100 lottery Saturday made me a one-time loser. Why have I labeled myself as a two-time loser? 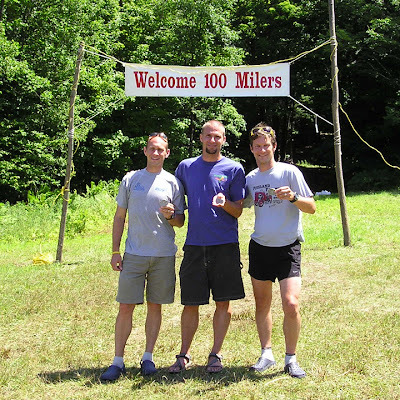 Well, during our lottery party Saturday I had convinced other one-time loser, James Demer (pictured right), to run the Massanutten Mountain Trails 100 with me. After some coaxing and browbeating, he agreed. Fast forward to today. The MMT 100 registration opened today and filled up in an hour! That's right, one hour. If you happened to be working today at 10 Am and maybe in a meeting until 11:30, you would have missed getting in...so I am not on the MMT 100 list. James Demer is on the list and I feel terrible that I let my friend and running buddy down. When I went to register at lunch and saw the race was full, my stomach dropped. I still can't believe it. So I am a two-time loser. While the Ultra Gods shined on Jamie this week (Jamie's phrase), they took a poop on me. All is not lost though. There is a waiting list and I mailed in my application for that process today. Last year those on the waiting list faired well, so I feel pretty good. I am going to train as if I am running the MMT 100 and be in really great shape for the 20th Anniversary of the Vermont 100. So this week starts my 100 mile training. Since we have been socked in by a pretty good snowfall yesterday, I hit the treadmill. More on that tomorrow. The lottery drawing is nigh. 1 hour and 20 minutes and counting. Guests will be arriving shortly to welcome either good news either for ourselves or the other lucky souls who get to run the Western States in June. To be chosen would be great; to not be chosen would be okay as well. Either way my 100-mile race plans for 2008 will be set. More later. So the countdown is on to the Western States 100 lottery drawing with just over two days to the drawing. We are having a lottery party here to hopefully one of us getting in. The involved parties are myself, James Demer and Jamie Anderson. While the chances are low, I am still feeling good that all three of us could get in. If not, there is always next year. Regardless, there is a 100 miler in my future next spring! 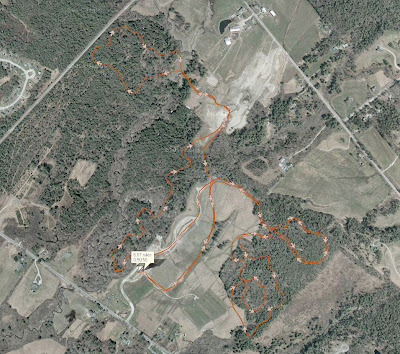 Going to VA in May for the Massanutten Mountain Trails 100 wouldn't be the worst thing. The last couple months have been somewhat uninspiring from a running perspective. After all the training for the Vermont 100 I was left feeling a little burned out. I am now ready to get back at it. Saturday will be good in that I will then have a goal race on the horizon and training once more will have a purpose beyond fitness maintenance. The last few days have been good in that I have been able to get out for some mid-day runs. Monday I ran with Ethan, Jim and Tom for just over 6 miles at a 7:30 pace while maintaining an average HR of 159. At this point in my training/fitness, this was a great tempo run. Yesterday Tom and I went out for just over 5.5 miles at a similar pace to Monday at an average HR of 147. Today was great in that I hit the trails, and by hit, I mean hit. After Monday night's rain, the trails behind work are a little wet. While making a little turn, my Nike Frees (terrible choice for trails, but that's all I had) failed me and I hit the mud. Jim was supportive but I am sure he was dieing laughing inside. Good run at a moderate pace. The 5.1 mile run was done at an 8:45 pace (given the unsteady footing and ups and downs and turns of the trails) at an average HR of 139. Hopefully tomorrow will grant me the time to get out as well. As far as the weekend, I have family in town which means running may not be possible, but Sunday I am on the fence on the Jingle Bell Run in Freeport. We'll see. This morning I got out a little later than usual. I had off today and took full advantage of the time. I woke up relatively late as my alarm clock (named Riley and Quinn) didn't go off until 7 AM. By the time I got out of the house, it was 8:20 and 30 degrees. The plan was to run down to Twin Brook park, run the trails a bit and then head home. The run to the park went well at a pace near 7:30 and I felt great. 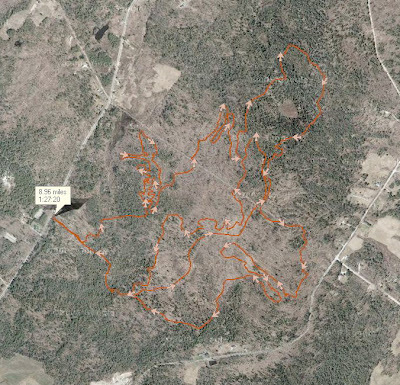 The run around the trails was a little complicated as there is a bit of construction going on and I found myself right in the middle of it when I tried to run across a patch of cleared ground which turned out to be mud. This lasted for about 100 yards and resulted in me carrying about 10 lbs. of mud on my feet. There were quite a few people milling around Twin Brook with their dogs, obviously enjoying their day off as I was mine. The trip home did not go as well. The temperatures did not change much as it was around 32 on the way back but what did change was the wind. I realized the reason for the easy trip to the park was due to tailwind I had been riding. This same wind about stood me up going home. At 32 degrees with the wind in my face, I realized I am not quite acclimated yet to run in the cold. For some reason the last few morning runs have left me short of breath and feeling as if my long gone exercise induced asthma was back. Not sure what's up but I will be keeping an eye on it. I did take this opportunity to listen to a few Podcasts from Endurance Radio and The Final Sprint. Highlights included a talk with David Goggins (the dude is unbelievable) and Karl Meltzer, a way laid back guy. Also of note is that we are now just over 7 days from the Western States 100 lottery. Knowing my chances are slim (but I am not giving up yet), I am very comfortable and excited about running a 100 in my native land of Virginia. 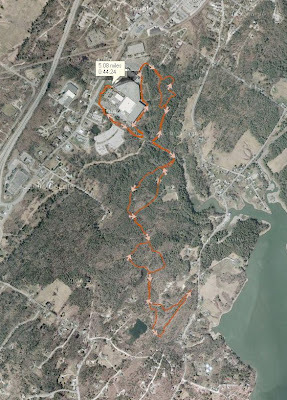 The Massanutten Mountain Trails 100 will be a very special race. We'll see soon enough. For a little enjoyment, check out the video below. Who would have thought I would find a real cool band watching an animated movie with my daughter (the movie is Surf's Up and is definitely as much geared towards adults than kids). First note before I get into the runs of the weekend. It appears that someone on the ultralist who is very involved in the Western States lottery puts the chances of getting drawn in the lottery at 16%. Not good. This year witnessed the largest lottery entries to date as well as an assumed lowest % chance to get in. 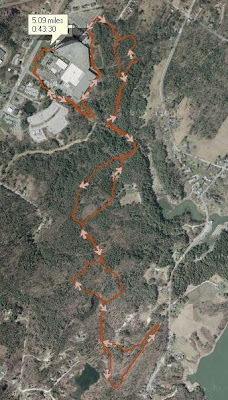 While I still feel good about my chances, I have started mentally preparing myself to tackle the Massanutten Mountain Trails 100-miler in May in VA. This actually will work out better with the Vermont 100 which is in late July. Stay tuned. This weekend was all Bradbury. Yesterday I met up with quite a Trail Monster crew, including Ian and Emma (check out Ian's 50-mile race report), Chuck, Eric Boucher, and a new TM by the name of Ben. We headed out a bit after 8 AM to make our way up to the summit of Bradbury Mountain. Even though one might not put epic and Bradbury Mountain in the same sentence, the course Ian took us on was indeed epic. There is some great trails with a sizable water crossing along with a couple pretty good climbs to a couple different summit lookouts. And you will do all this twice if you decide to do the race Ian is planning for next year. In fact, the course could be considered downright cruel. In fact, I hit my max heart rate on the climb up to the Bradbury summit and I felt every beat. I had family obligations so I bailed on the group after the first 4.75 loop that took us nearly 48 minutes. Not quite the pace I was expecting but it was fun. This morning I had the good fortune of hooking up with my buddy and blogging legend Jamie Anderson for a run around the east side of Bradbury Mountain State Park. 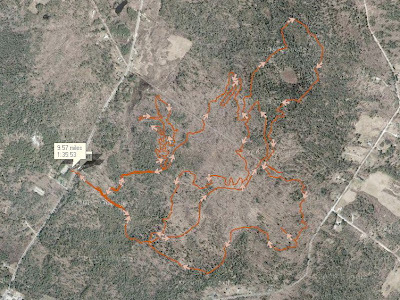 We pretty much followed the Bradbury Bruiser course with the exception of the punishing "O" Trail. The run started shortly after 7 AM in temperatures I have not run in this year. The 22 F temp at the outset was a bit much for my poor digits which took most of the run to warm up. I have yet to find the perfect clothing combination for every gradient and this morning was no exception. I was freezing at the outset, melting 45 minutes in, and then cold again after removing my outer layer of fleece. At least this is something to aspire to. As always, the run was good and the conversation better. I feel a great kinship with Jamie, and maybe this is the fact that we are both southerners aspiring to be New Englanders. Much like the flowing of stories that happens when two southerners sit down with a bottle of bourbon, Jamie and I follow and explore the arcane and expound on it until we completely get it. This morning this was a good thing as my legs did not want to cooperate. I was sluggish for most of the run, but when my legs and mind came around, I felt great. By the end of the run I had reaffirmed why I allow myself to leave the warmth of my bed to endure a cardiovascular punishment in the cold. It's just good to be alive doing these things I love with good friends. All told, we ran just over 10 miles in about 1 hour and 40 minutes. Cheers. This past week was a good one. Work is a little more under control and I got out for a few great runs. The weather has been unbelievable. We had a couple days this week with temps that got into the 50s. One day was downright warm. I did run a couple road runs with negative splits that got me down to about a 7:00/mile pace. Thursday Tom Tero and I braved the South Freeport trail system behind L.L.Bean despite another runner's spotting of a couple hunters (with rifles!). It was well worth it as the trails are a welcome relief from the hard, dull asphalt. 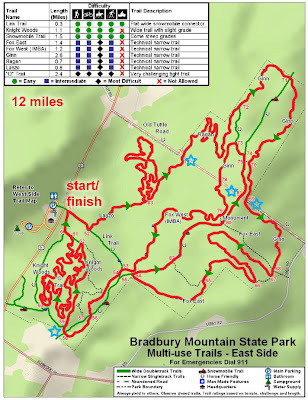 This weekend I am planning for a full agenda of Bradbury mountain running. Tomorrow I am heading to the west side to run the mountain and Sunday I am planning on running the east side which consists of the trails we used for the Bradbury Bruiser. Saturday's run starts at 8 AM and Sunday I am starting at 7 AM. Come on out if you like. I am meeting some other Trail Monsters and am looking forward to it. The drawing for the Western States 100 is 15 days away. There are over 1,350 people entered for just 400 spots. That leaves me and my buddies Jamie Anderson and James Demer just under a 30% chance of getting the privilege to run the Sierra Nevada in June. Keep an eye on the website December 1st starting at Noon as winners of the lottery will be posted every few minutes as they are drawn. More importantly, this week showcased my daughter Riley's three year check-up and my "discharge" from the Maine Center for Cancer Medicine. Riley got a flu shot and I was told I was free to go with no more cancer checks, that is unless I am invaded once more which I was told was more likely in those that have had cancer previously versus the general public. Oh well, I guess I am living dangerously. Five years have passed now since my life was irrevocably changed and I am grateful for those five years. My theory during this time has been to grab life by the b***s and enjoy the ride. I think I have done that. I will have to write more about that soon. In fact, that is the theme I am planning for an article I am going to attempt to get published (following in the footsteps of fellow hundred miler and friend Jamie Anderson). I missed my run this morning. Today was the first time I have been a no-show at a run where I said I would be. I have all the usual excuses that I usually shelve once the alarm goes off and I start getting ready for the run, but this morning they got the better of me. The usual suspects are later to bed than planned, a fussy child in bed with us who never stops moving the entire night, too cold, and just plain tired. As I noted in an earlier post, work has been getting the better of me and leaving me feeling beat up. So I took this morning off. Besides, soon enough there will be another 100-miler looming on the horizon to start training for and that is when the excuses will be ignored. In just three weeks the drawing for the Western States 100 will take place and I will know if that is where I will be running in late June. Until then, I think I will enjoy my time in bed with my kids on these marginal days! Unfortunately, I left my buddy Chuck hanging this morning, and for that I am sorry. It seems like he had a great run. Also of note, my friend Ian ran a successful Stone Cat 50-miler today and his wife Emma actually won the women's title in the trail marathon. Congratulations to them. That is one race I really was hoping to get in on but things at home built up that need attending to after a couple weekends of family from out of town. On a cool note, I got over to L.L.Bean's Winter Sports Festival yesterday and was able to spend a little bit of time on the air rifle (laser equipped) at the Maine Winter Sports Center's booth and had a great time. I am looking forward to checking out Biathlon this winter and especially some of the run/rifle biathlon's in Southern Maine next summer. Cheers. Last week I celebrated a couple very important milestones, none of which involved running. My daughter turned three on Sunday(!) and I hit my five year cancer free date. As far as running, I got in four miles. My daughter Riley turned three on Sunday. After the party we sat down and watched the videos of the day she was born and looked at photos. It is unbelievable that three years has passed. I am already finding myself reminiscing of when she was "small". Boy am I in trouble when she goes off to college...The party was a hoot with a bunch of Riley's friends doing hoola hoops outside. It was a good time. Happy Birthday to my little girl. Last Wednesday I hit my five years of being cancer free, earning me the distinction of being as "cured" as one can be of cancer. It has been five years since I heard those fateful words, "You have cancer", and was subjected to the most painful thing I have ever experienced: a bone marrow test. Ouch. Running a 100 miles is nothing compared to that needle pushed into the hip. Lance Armstrong did not need drugs to win the TDF seven times because he had a well of tough experiences from which to pull perseverance. Once you have been down the hall to a chemo ward, you do not exit the same person. You are emboldended. Your faith is deepened and set in concrete. You love life and go after everything you never did with a passion not commonly found in others. You win the TDF seven times. You run 100 miles. You live and you love like you never have. But you still have to work. Work as of late has been tremendously stressful and all consuming of much of my time. Such is life. I did manage to get in one post-Bradbury Bruiser run last week through the woods of Freeport and another run in today through the same woods. Today was beautiful, with a nice crisp feel to the air. Perfect running weather. 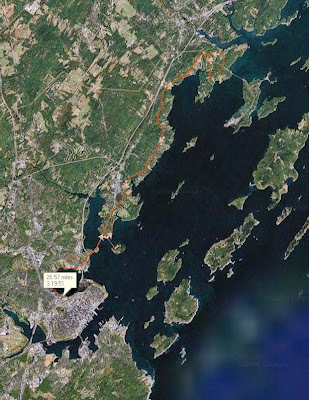 Tom Tero and I took a 5.2 mile jaunt through the LLB trails and discussed my race plans for these woods. I am trying to figure out how to keep the runners from doubling back on the course into the face of slower runners. I have some time to next spring to get this right. It should be a fun course. My buddy Jamie Anderson sent me a link to the following YouTube video of a Vermont 100 mile participant. Check it out if for nothing else than the guy's vacant stare about half way through. God bless him. Also, the soundtrack is excellent.